To some people, Thai tattoos are more than mere artwork on skin. They're part of a deeper belief system that touches the core of Thai society. Spiritualism and Thai tattoos are so entwined that they are practically inseparable. Although Buddhism permeates Thailand's society, there is an even deeper belief in Animism that is woven into the very fabric of the culture. Animism is all about the union of spirit and matter - there is no separation of the body from the soul, and all forms of life have their own personal soul. People, animals, insects, plants are all imbued with a personal life force that is indestructible. Animism is not tied strictly to living things either. This belief system also maintains that material objects have their own souls that have some bearing on their destiny. The average believer would then encounter countless souls as he goes about his daily life; some good, some evil and some indifferent. How does this relate to tattoos? In Thai tradition, getting a tattoo is a deeply spiritual experience, just as it can be for many people the world over. However, a genuine Thai tattoo received from one of the Buddhist monks is believed to act as an amulet that carries powers of its own. Believers seek these tats as a form of gaining strength and protection from the spiritual realm, and, to some degree, a bit of control over it. As the monks work away at the flesh, they pray over the tats they are creating, instilling each design with the qualities traditionally associated with it. A tattoo of a particular god might gain that god's favor, protection and guidance over the wearer's life. 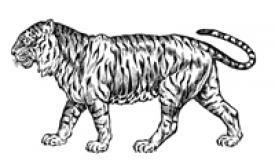 The tattoo of an animal like a tiger might protect the person wearing it from evil and physical harm, for example. For some people, Thai tattoos are synonymous with the annual tattoo festival at the Therevada temple of Wat Bang Phra. Here east meets west as everyone gathers to take part in the rituals and receive blessings from the Buddhist monks.For many, the ultimate blessing is received in the form of a tattoo, and these tattoos are still created in the same way they have been for thousands of years. There are no electric tattoo machines here. The monks create their images by hand using double-pronged rods to systematically puncture the skin thousands of times, driving the ink dipped tips below the surface. This brings us to the next point. Sterilization is nearly non-existent at one of these festivals, so the same tools are used on person after person. This creates a high risk situation for the transfer of blood borne diseases like HIV and Hepatitis C. This is definitely a risk you need to consider if you have any inclination toward taking part in the festival. What's in Authentic Thai Ink? Unlike the standard tattoo inks you'll find in Western tattoo parlors, genuine Thai inks made by the Buddhist monks may be concocted from any number of ingredients, some of them a bit disturbing if the tales are true. After being tattooed, many people seemed to be quite affected by the experience. Some report feeling a great serenity come over them, while others appear to be caught in the grips of combat with an unseen entity. Whether these experiences are metaphysical in nature, or simply a reaction to the ink ingredients is yet to be determined. 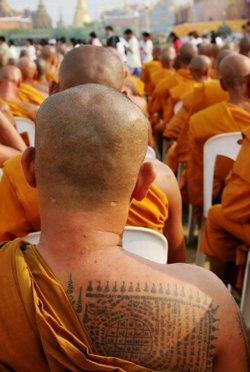 Traditional Thai writing is often used in tattoos. These generally consist of prayers or incantations meant to protect the person wearing the tat. Actress Angelina Jolie actually has one of these on the back of her left shoulder that is said to be a prayer for her oldest adopted child. Here we come to a tricky point encountered when getting a tat in a language that may be foreign to you. You're going to need a true expert in Thai tattoos if you decide to get an inscription. Ancient Khmer writing is extremely complicated, and few outsiders are able to decipher it, let alone recreate it accurately. If you're going to let an artist write something on your body, you want to be sure of what it says. Thai temple tattoos combine images and inscriptions into a seamless design. Geometric shapes and images of gods are filled with prayer inscriptions believed to provide magical powers. Temple tattoos are usually quite large, and may cover a person's entire back or chest. Are you intrigued by the concept of Thai tattoos, from the artwork itself to the belief system behind it? Then be prepared to do some legwork before you commit to an artist or design. Visit a few tattoo shops and talk to the artists there about what you're looking for. Chances are the name of a particular artist will keep popping up among the recommendations. This is one of the best ways to make sure you'll be in good hands.